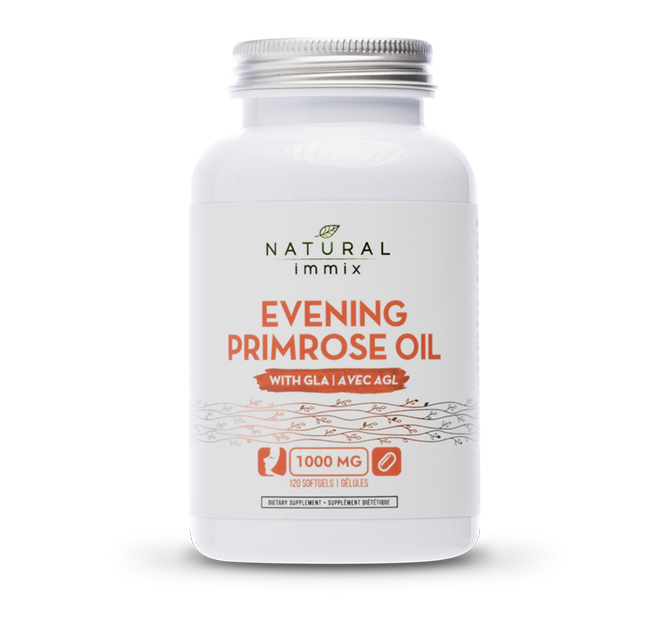 Evening Primrose Oil is derived from tiny seeds of the yellow wildflower, Oenothera biennis L., which is native to North America and blooms in the evening, hence its name. Evening Primrose Oil contains a natural source of Gamma-Linolenic Acid (GLA), which is an Omega-6 fatty acid. Essential fatty acids are required by the body for growth and development, and must be obtained from the diet. The body converts GLA into hormone-like compounds known as the prostaglandins (PG's), which are essential to the maintenance and regulation of many physiological functions in the body. The body can produce both pro-inflammatory and anti-inflammatory PG's. The GLA found in evening primrose oil is beneficial for treating a variety of conditions, because of its ability to increase the production of anti-inflammatory PG's. Evening Primrose Oil is a factor in the maintenance and regulation of such functions as cell growth, cell regeneration, skin condition, menstrual cycle, and blood pressure. Formulated from natural sources, Evening Primrose Oil softgel capsules are pharmaceutically tested to guarantee full potency and clinical purity and are a factor in the maintenance of good health. Evening Primrose Oil has been used since the 1930's as a folk or traditional remedy for eczema. More recent folk uses include other conditions involving inflammation, such as rheumatoid arthritis; conditions affecting women’s health, such as breast pain associated with the menstrual cycle, menopausal symptoms, and premenstrual syndrome (PMS). Uses have also been recorded for cancer Alzheimer's disease and diabetes. GLA is normally synthesized in the liver from dietary sources of Linoleic Acid (LA), an essential fatty acid. However, the process of conversion from dietary LA into GLA in the body is a slow process. Supplementation with Evening Primrose Oil is beneficial because 7-10% of its fatty acids are already in the form of GLA. As a result, Evening Primrose Oil directly provides a concentrated source of this important Omega-6 fatty acid. The GLA found in Evening Primrose Oil is widely recognized as an effective anti-inflammatory agent, and is beneficial for treating joint pain and swelling caused by arthritis and other autoimmune disorders. This Omega-6 fatty acid can also assist in normalizing hormone levels and may help address symptoms of PMS such as bloating, breast tenderness, abdominal cramps, irritability and mood swings. In addition, GLA promotes the healthy growth and maintenance of skin, hair and nails. By reducing the production of inflammatory compounds, Evening Primrose Oil can decrease the itching associated with atopic eczema, potentially eliminating the need for topical steroid creams or drugs, which have a variety of negative side effects. Studies have also shown Evening Primrose Oil to be beneficial in the prevention of neuropathy (nerve damage), a common complication that can occur in individuals with diabetes.